Adults who experience close intergenerational interaction are less prone to depression and have better physical health, as they feel more active and productive. They tend to be happier with their present life and more hopeful for the future. Staff at the local elementary schools studying the Holocaust, call Alpert Jewish Family Service agency (AJFS) on a regular basis, for help with recruiting survivors to speak to the students about their wartime experiences. The challenge for any professional caseworker is identifying and supporting the appropriate client, to provide them with the chance to express what they wish to share in a way that is both cathartically meaningful to them and educational for the students. The considerations for this project focused on the interaction between students and survivors. How would story sharing between older adults with trauma history and students work? Would children gain from this interaction, and would survivors feel validated? What is the impact of a Holocaust survivor speaking at a public school, where most students are not Jewish? Much reflection was given to which survivors would derive the most psychological support and help from this project. Who would the students accept? Who could articulate their story well to eight and nine-year-old children without traumatizing them? Who would most benefit from the acceptance and validation an eight or nine-year-old student could offer? AJFS received a call three years ago from a public school 4th grade teacher who had recently completed a mandated (although unfunded) history curriculum unit on the Holocaust with her class. After a discussion with her about the varying experiences survivors had during the war, it seemed that survivors’ stories would, indeed, resonate with younger children. Most survivors who are well enough to make the trip to the school were themselves children or teenagers during the war (anywhere from three to 19 years old). This, we realized, had the potential to make the story-sharing project even more powerful, as these survivors could relay their experiences through the eyes of a child—with the added perspective of the living history presentation by an adult. We determined that elementary school students would mostly come to this experience being less judgmental and with higher positive regard towards older adults (the Holocaust survivors). These children would be able to picture themselves in the survivor’s narrative of their unique story and imagine what it would have been like for them in the survivor’s pre-war home, school experiences, and life with their family of origin. All the Holocaust survivor clients chosen were articulate, insightful, engaging and considerate as presenters. However, they needed to be prepared for what it would be like to walk into a classroom of 35 students, along with many parents and teachers. The students and teachers needed to be prepared for what it would be like to have guests that were all over the age of 80, who would be sharing the stories of their lives, within a historical context. The case managers would explain what and how many countries were involved; how massive the Holocaust was in terms of numbers; and the different scenarios and situations clients and their families found themselves trapped by wartime Europe. 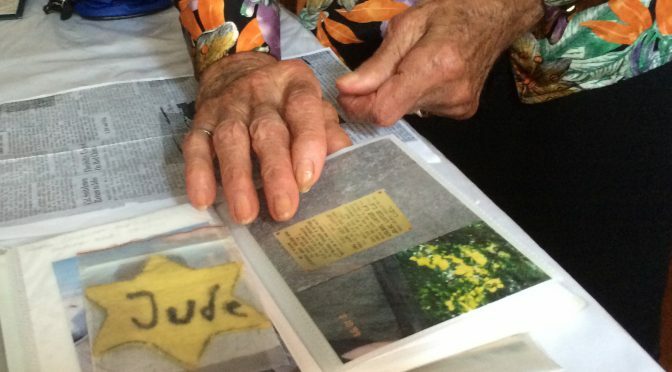 The themes that surfaced from Holocaust survivor clients became relevant to elementary school students in ways that transcended the classroom setting or the personal or geo-political and historical significance of WWII. Mrs. G. and Mr. N. are friends who were invited to come to the school to present together. Mr. N., from Hungary was an eight-year-old child of a Catholic mother and Jewish father. His parents were never married. His mother abandoned him with his father when the situation became more difficult and unsafe for Jews. Mr. N. described his early school years and life before the war. He painted a picture of an eight-year-old boy with a relatively normal home life (although in 1942 single fathers were unusual) and relatively normal school life in pre-war Hungary. While Mr. N.’s father did not have many material belongings, he described a deep emotional attachment towards his father. He described the food shortages once the war came to Hungary and the experience of living in extremely crowded conditions in the star houses. (Jews in Budapest were forced to leave their homes during mass deportations and crowd into star houses; which were designated houses painted with a Star of David). He was proud of his father’s attempt and success in hiding him in a Catholic boy’s home for the remainder of the war. Mr. N. reminded the children that in the pre-war years he had no religion however, once the Nazis took power he was identified as Jewish due to his lineage, and then identified as Catholic, in hiding. The students were riveted as he described the fear of a 10-year-old boy sneaking out of the Catholic boy’s home to return to the “star house” only to learn that his only parent, (his father) had been rounded up and taken by the Nazis. He shared how after the war, he found it difficult to find acceptance in the Jewish community, since he was thought to be a Catholic. His story resonated with the children as he exposed the fear and hatred exhibited towards him, as a child of “mixed” lineage. Telling his story provided him a place to share his feelings from his experiences of not feeling accepted; abandonment and betrayal. Mrs. G. is still feisty at 93 years old. She stood at just five feet tall and wore a pink suit and (low) heels; she had bright red hair and perfectly manicured nails. She began to narrate her story of how she left her small village when she was 18 years old to move to Budapest, a big city to work. In 1944 a Gestapo policeman picked her up as she was out after curfew. She was not wearing the required yellow star, which identified her as Jewish. In a heavy European accent, she described how the policeman forced her into the back of his car. She described her fear as a young woman who found the courage to persuade the policeman to let her go, continuing to talk to the policeman non-stop asking him what he “gets” out of bringing her in to the police station. The students listened quietly as she described her relief when the policeman finally stopped the car and yelled at her to get out and told her that he never wants to see her again. After this close call, her non-Jewish boss agreed to hide her at his mother’s house in the country. To keep this household safe, they placed a sign at the door that the people living in the home had a “contagious disease,” so that they would not be disturbed and could keep hiding. This man, her boss, became her husband after the war. She felt she owed him, for saving her life. After her husband died, Mrs. G. came to the United States, where she was reunited with her childhood sweetheart who had miraculously survived the concentration camps. The Holocaust survivors continued to tell their story, now focused on their lives in the present, as older adults. Mrs. G. and Mr. N. were frequently asked by students if they are married. They gained rapport with the children as they informed them that they are indeed a couple, but just as friends. Mr. N. and Mrs. G. shared their interests with the boys and girls as they discussed current events, including soccer matches and the current dances, which Mrs. G. compared to ballroom dancing from her youth. The students appreciated that these individuals had unique life experiences. Mr. N. explained to them that differences are to be celebrated and shared. The Holocaust survivors, Mrs. G. and Mr. N. expressed feeling validated from their interactions with these young students. After the presentation both survivors responded to questions about their pre-war days, and their school experiences before the war. They clearly expressed to the teacher and the parents how impressed they were with the thoughtful questions the students asked. They were surprised and proud that the students were all so attentive. After their presentation, students jumped up to give them hugs, fist bumps, take pictures, and thanked them. The students formed a tight circle around them, vying for attention from both Mr. N. and Mrs. G. The survivors were invited for lunch after the presentation in the teacher’s lounge, which made them feel welcome and accepted as part of the school community. A couple of weeks after the school presentations, the students delivered hand-written thank you notes to the agency. The caseworker forwarded a package of over 50 notes to the Holocaust survivors. Impact on Mr. N. and Mrs. G.
As the clients and case manager reflected upon the experience of sharing their stories and read the notes together, the Holocaust survivors were once again surprised at how interested the students were. They were proud of the questions and comments from young students; that gave them the feeling of relevance in today’s world, the feeling they will be remembered. Mrs. G. felt relieved to have the opportunity to speak of her first husband -the man who stood up for her and risked everything to save her life. She was proud to show his picture and give a voice to his love that saved her life so long ago. She displays the student’s notes proudly and some hang on her refrigerator. Mr. N., who carried feelings of non-acceptance his entire life both as a Jew and a Catholic was also impressed at how relevant his story, is to young people today. He felt validated and accepted by the students and the teacher, who extolled his message of respecting, celebrating and embracing those with differences. Mr. H. was an artist who suffered from depression over the course of his life. He was from Germany and suffered through the anti-Semitism from 1933-1940. His father was rounded up during Kristallnacht and sent to a concentration camp, after which Mr. H. and the surviving family fled. Mr. H. spoke vividly about the hatred exhibited towards him, and the loss of his friends. He described the depravation of food, which left him hungry all the time. He shared how he felt as a child to lose the friends he had, those friends he played with every day; simply because he was perceived as different. He described how he still could not understand (years later) how those who were neighbors could spit at him, or just accept the events that were happening around them all. He painted a vivid picture of how he felt when his father was arrested, tied with rope to the other men in the town and beaten in front of everyone- stripped of his dignity. He was left alone with his mother and brother struggling to find food and shelter. “There’s no room for hatred in this world only love and peace,” Mr. H. told the students. This maxim was instituted in the fourth-grade classrooms. The teacher hung the words on the wall and the children worked projects around the words to truly understand what that means in today’s world. Mr. H., who came to the United States at a relatively young age, was able to connect with the students by speaking about his time when he came to New York and was a crossing guard (just like some of the students today). At the end of his presentations, students surrounded him, to show him love and affection and admiration-to be close to him. Mr. H. brought one of his paintings to show the students. One of the children asked him if he paints anything from his time in Europe. He said he did not paint anything from Europe, as he only wanted to paint beautiful things that make people feel good. The children could feel how genuine his words were, and how gentle his nature was as he patiently answered every question. On the way out of the school Mr. H. was asked by the teacher whether he could come back to visit. Sadly, that did not happen as he passed away during that year. While he was sick before he died, he sat reading the notes the children sent him and expressed both joy and appreciation for their support. Mr. H. was touched when he received the thoughtful notes and pictures from the young students. As he processed the experience of sharing his painful narrative, he spoke of how emotionally liberating it was to speak to young children. He felt so graciously accepted by the teachers and parents. He was honored the teacher asked him back for the next year to present again. He felt the school community genuinely cared for him. He spoke of writing a children’s book, an idea that gave him hope and purpose. He had the opportunity to teach children about the dangers of hatred. He clearly felt by teaching the students about loving-kindness the world would have a chance to be a better place. He felt he was accepted into the school community, which gave him a sense of being acceptance. Mr. L. was thirteen when he was displaced, rounded-up and sent to the ghetto and subsequently to several concentration camps. He described his pre-war life in Lithuania and the drastic changes that came as the war impacted his family’s lives. As he tells his story, the children were listening with wide-eyed interest, and even the teacher was teary. Mr. L. described himself as having been a very “big kid” so he was able to pass as a young adult upon his arrival at concentration camp. Mr. L. described how he had been caught with two potatoes given to him in the concentration camp by a woman working in the kitchen who he knew him in their pre-war life. He was interrogated and the guard who caught him demanded to know where he got the potatoes. He said he knew that if he told about the woman in the kitchen, she would “be dead.” He explained how he was left outside in the freezing cold as punishment and he was sure he would be killed. However, the guard went to a party and forgot about him out in the cold. Thankfully, a friend in the camp brought him inside, to thaw out. The students asked thoughtful questions such as: how it felt to be a hero by saving the life of the woman he knew in the kitchen, and how did it feel when he arrived at the camp, what was he thinking at liberation? He described his search for his parents after the war and how he lost his leg as he tried to jump on a train heading east toward his pre-war town, to find his parents. Through his words the students were able to visualize the upward battle toward his recovery. They understood the emotional and physical losses and challenges he had, to make productive life after the war and the accident. He showed them his pride in his unwillingness to give up on his life. Weeks later, Mr. L. met one of those students out, in the community at the medical supply business belonging to the student’s father. Mr. L. spoke of how the student told all the people in the store about how he knew him, and that Mr. L. was a speaker in the school and a Holocaust survivor. Mr. L. was touched by how much of his personal story resonated and how his story will be passed on. After experiencing the recognition and validation of the children Mr. L. committed to the teacher that he would donate his “Spielberg” tape to the school. He was invited to a presentation scheduled with the school’s staff. The school was in the midst of preparing a ceremony to present Mr. L. with a plaque when he unexpectedly passed away. After so much personal loss, Mr. L. received recognition and validation. Mr. L. left his legacy through his willingness to share his story. Mr. B. left Germany with his parents to go to Shanghai and escape the Nazis along with his brother, and sister. He described his older brother and sister as “more normal” as they had the experience of the pre-war, pre-Nuremburg laws in Germany when life was normal. The family was wealthy and did not need for anything. As he showed the students his German and Chinese (legal) papers, from which they learned about life in the ghetto, through his perspective as a young child. He expressed having had feelings of not belonging and the difficulties and struggles in school. He could not pay attention. He explained that he was aware of his perception of his parents’ stress. He described a long boat trip, and the crowded conditions on the ship and in the ghetto. Mr. B. spoke of his multi country citizenship, and the difficulties of starting new schools and learning new languages. The students surrounded him to get closer, so they could hear every word and better understand his experiences. After the presentation, the teacher explored with him if he had ever considered that he might have had a type of attention deficit disorder (ADD)? Ironically, he was diagnosed with ADD in his post retirement years. Mr. B. received and read the notes from the children that were delivered to him. As he and the caseworker processed the experience, he sounded surprised at the warm reception from the children. After the presentation, when the students spoke about their own interactions with their parents, he recounted how much he felt validated, and that he himself better understood the negative interactions that he and his parents had experienced. When the children had asked questions about his early schooling in China and subsequent schooling in Israel and the United States, it did help him think through his own anger and frustration his parents must have experienced, when they dealt with him. By processing the interactions between himself and the students he understood his own feelings as a child (frustration and lack of self-esteem) and the tragic circumstances his parents found themselves in, as a result of his learning challenge. All the participants are unmarried, with no children. All the Holocaust survivors described in this project had not spoken publicly, prior to presenting to these students. Survivors received individual notes and drawings from each student who participated in the program, which seemed to have the biggest lasting positive impact, following their presentations. When they read those notes and showed them to their neighbors and friends, they felt appreciated, as expressed in the words of the students. They felt heard by the young students, demonstrated by the questions they asked and interest they showed. All who participated were bolstered by the energy of an elementary school environment. Students were charmed by the old-world manners and the attention they received from these older adults. The students had the opportunity to walk in the halls of history. A personal account, which untangles the multitudes and focuses on the individual, is the most powerful way to teach the events of the Holocaust, reinforcing empathy towards victims and most importantly, the lessons learned from the horrors of the past. Most of the survivors returned the next year to the school by request. The school staff remembered those survivors that passed away. All of the Holocaust survivors who participated in this project were given a chance to be part of a community that is genuinely interested in the story of their lives. These survivors felt empowered seeing themselves as educators. Not only did they discuss their lives during the war but also their post-war experiences, particularly when they immigrated to the United States, of which they were very proud. Several of the remaining survivors struggle daily with their health, their memories and their legacy. Holocaust survivors worry about the next generations. Will they learn the lessons of history, and will their individual and collective personal histories be forgotten? In later life, when friends are gone, the need to share with others becomes urgent; to bear witness is vital. Participation in school programs with young children provides the student with shared feelings and crosses intercultural divides. This project supports the theory that intergenerational programs empower Holocaust survivors to transcend their victim self-concept and assume roles as witnesses-to-history and educators in the community. Clients names are omitted to protect their privacy. I would like to thank the Claims Conference for their support of services to the Holocaust survivors mentioned in this paper. SCHINDLER R. , Spiegel C. & Malachi E. Silences: helping elderly Holocaust victims deal with the past. (1992); 35 (4) 243-252.Int of Hum Dev.